Fire and Forget™ first checks if a campaign needs to be paused because of Stop Amount. If a campaign is in Stop Amount the campaign is paused and no other optimizations occur. If the campaign receives conversions after being paused and no longer meets the requirement for Stop Amount, the campaign will be unpaused. Campaigns that remain in Stop Amount will be restarted the next day. Next, if a campaign is not in Stop Amount, Maximus will check if the campaign is in Slow Amount. If it is in Slow Amount, the CPC is set to Lowest Bid and site bids are removed. No other optimizations will be performed if the campaign is in Slow Amount. Next, Maximus will check if the campaign should be in Day Parting. If it should be in day parting, Maximus will either pause or adjust the CPC depending on the settings the media buyer has selected. If CPC day parting is enabled, site bids will be removed. After day parting has concluded, the CPC will be reset to the CPC before the campaign went into day parting if the CPC reset for day parting feature has been enabled (site bids will not be reset). 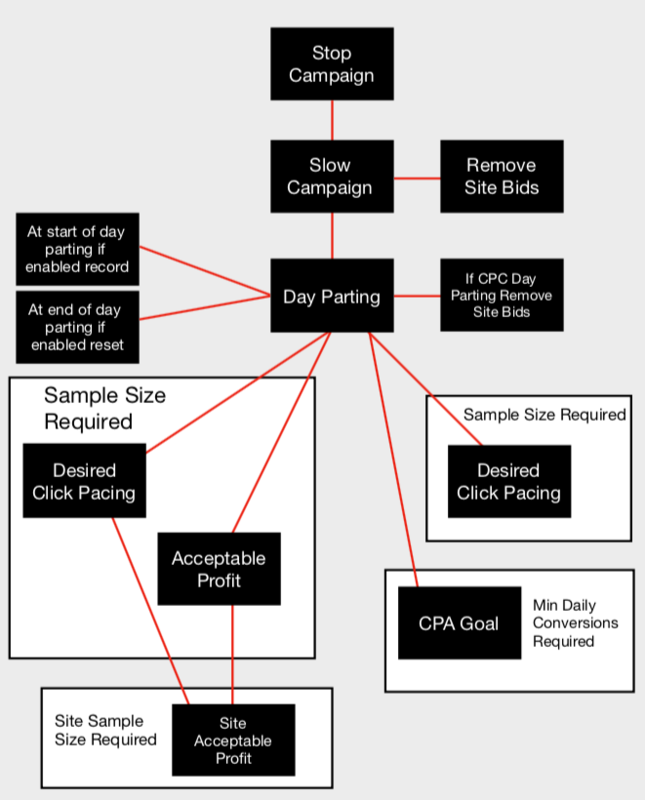 If a campaign is in day parting no other optimization will occur. Next, Maximus will check if the Sample Size requirement has been met over the Look Back Days selected and analyze the appropriate data to perform the Desired Click Pacing or Acceptable Profit optimizations. First, Maximus will check if the campaign is not receiving enough traffic. If the campaign is not receiving enough traffic, it will begin Desired Click Pacing. If the campaign is receiving enough traffic, Maximus will perform the Acceptable Profit optimization or the CPA Goal optimization. Next, Maximus will run the site Acceptable Profit on sites that meet Site Sample Size. The Left Path follows the Acceptable Profit Optimization Modes flow through Fire & Forget™, starting from top and working its way down. If you are using None mode, use the Left path ignoring (campaign) Acceptable Profit. The Right Path follows the CPA Goal Optimization Mode. Click here to learn more about Optimization Modes.